Justice represents a woman with a severe look. Sitting on a golden throne, she seems uncompromising and impartial. She wears a red tunic and a blue cape over it. She holds a sword in her right hand, which shows that she has the means to punish. She is a figure of judge and seems able to interpret conflicts with severity. In her left hand, she holds a perfectly stabled weighing scale. It shows the neutrality of her justice and the stability of her organization. Justice is the perfect symbol of fairness and stability. Organized, she seduces by her practical mind, her precision and her neutrality. Using objective criteria, Justice allows living in the society in a pacific manner. 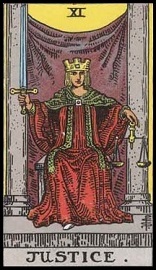 With the High Priestess (II) or the Hierophant (V), Justice is the sign of a contractual agreement. Justice suffers from her rigidity. She has issues evolving with her time and seems victim of her interpretation. Justice is litigious and complicated. Associated with the unnamed arcane, she is negative and shows a form of break-up. Justice is a methodical and thorough person. Of course, she is honest and likes what is just and egalitarian. She can be diplomatic and enjoys compromise. You like to organize your life, to anticipate and to see things happening as you planned. The fact that you are a rigid person may be hard for your entourage. Things have to happen as you planned, and if not you feel paralyzed and you get nervous, as you need to control everything. You can be slow when it comes to changing you way of thinking and adapting to your peers. Try to act with moderation. Calm down and try to show some patience. Take the happening events one by one and manage them with distance and intelligence. Do not try to think out of the box; now is not the time to do so. Do not take initiatives too different from what you usually do. Do not cross your limits this upcoming month, keep some distance. A decision from court could also be expected. Do not expect a big life change. You will be rewarded for what you have accomplished, nothing more and nothing less. You will get from the others what you have given them, and not wait for more or you may be disappointed. Life will not give you anything free, you will have to get things and invest yourself. You have to take responsibility for your past actions. You will not be able to overcome them and you have to stop thinking about it. Start looking towards the future as you have much more things to earn and learn there. If you have a project, remember that you will have to work to make it happen. If you do so you will succeed Justice gives a chance to everyone but does not favour anyone.